My artistic style changes depending on the medium with which I'm working. I am inspired by colorful designs everywhere...nature, fabric, artwork, magazines, books...anywhere I look. I love working with materials that are shiny and/or colorful: crystals, faceted beads, colored glass, decorator fabric, scrap-booking paper, paint, ceramic or glass tile. 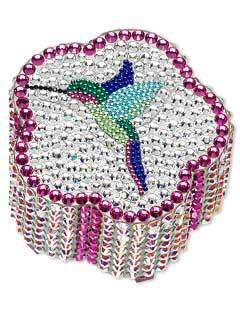 I thought a tiny hummingbird, a "jewel of the sky", would be an appropriate adornment for a tiny jewelry box. I had the basic design of the jewelry box in my head. I then chose the box shape. From there, the design just evolved. In the 1960s, my mother was a sales consultant for a national company that sold jewelry at home parties. Going through her sample cases was one of my favorite pastimes. I have loved jewelry ever since. About eight years ago, while on vacation in Florida, I stopped in a bead store. The owner helped me design and assemble a necklace/earrings set. For my birthday a few months later, my family gave me beads and a design board. Since I had forgotten everything the bead store owner had taught me, I bought some beading books and tools, then took a class. I was hooked...beading is SO addictive. I consider myself a self-taught multi-media artisan. I have been involved in arts and crafts since I was a young girl. There are very few crafts I haven't tried. I am happiest when "creating." While reading a beading magazine, I saw an ad for Fire Mountain Gems, checked out the website and immediately ordered a catalog. Once received, I studied the catalog to learn about the different types of stones and beads available. I use the Fire Mountain Gems comprehensive catalog like a reference book. 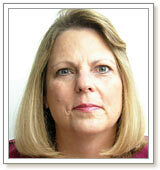 Besides beading, I enjoy mosaics, stained glass, sewing, home décor, gardening, party planning, reading and traveling. For me, jewelry-making is a creative outlet that I enjoy tremendously. I find it hard to become bored since there are so many beautiful beads available and the designs floating around in my head are endless. I have a website on ARTFIRE--a fabulous Handmade Artisan Marketplace www.crystalpeacock.artfire.com. I also sell my custom creations by a word-of-mouth network via family and friends. And I always carry my business cards to hand out to anyone interested. I regularly donate to the fund-raising events of the schools and churches my family members attend or have attended. My advice for aspiring jewelry-artists would be to take a beginner's jewelry-making class at a reputable bead store or bead show. Learn the basics from a professional or seasoned beader. Quality workmanship is extremely important to your reputation as an artist especially if you decide to sell your jewelry.